I love birthdays! Now that I have kids they have become even more fun. There is nothing like celebrating with a child. They get such joy out of the smallest things. There is nothing quite like listening to a little girl giggling in her excitement. And there is nothing quite like giving her a dose of what she perceives as magic. I am forever cheap however, so I don’t like to spend too much money on these celebrations. I’m always looking for fun and creative ways to bring in a little excitement to my kid’s special days without breaking the bank. This year, to celebrate my daughter’s fifth birthday I wanted her to wake up to the magic of her special day. So the night before the big day after she was fast asleep, daddy and I blew up roughly 75 balloons (which we bought for $2.99) in her favorite colors. No helium, just good old hot air (of which I have plenty!). Besides being a little light headed when we finished it was a pretty easy feat. Then as sneakily as we could we crept up to her room and filled the floor with the balloons. Seventy five balloons was just enough to fill the floor, at least the floor that isn’t already covered with toys. Some areas even had a double layer of balloons. The biggest draw back was that we weren’t in her room when she woke up. We debated waking her up a little early so we could partake in the excitement, but decided that the magic would happen if she found it on her own. Luckily we still have a baby monitor in her room. We turned it on and waited patiently for the morning to come. We were not disappointed! There is nothing quite like listening to a little girl giggling in her excitement. And there is nothing quite like giving her a dose of what she perceives as magic. 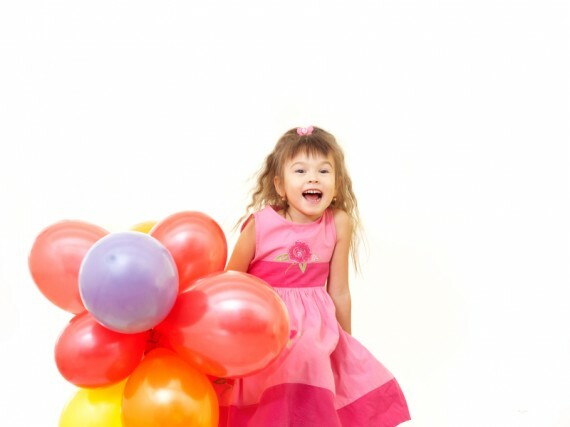 What other ways have you found to delight your kids (on a budget) on their birthdays?